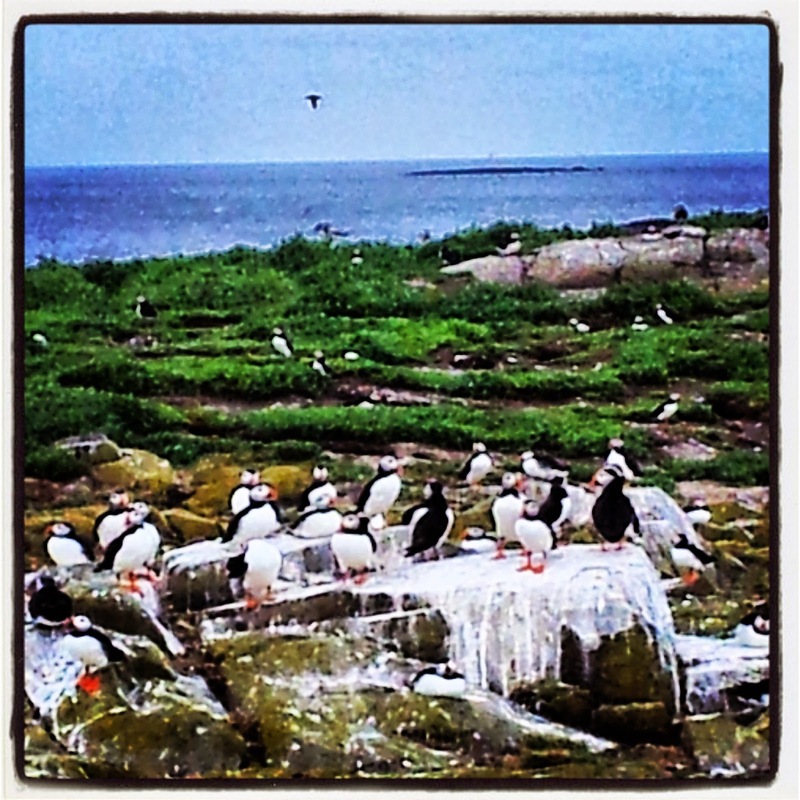 Farne Islands are a group of uninhabited islands along the Northumberland shore, on the border between England and Scotland. With "uninhabited" I mean that they are not inhabited by human beings; but yet they have quite a number of inhabitants. They all are inhabitants with feathers, wings and a beak, and there are so many of them that the National Trust has made a protected oasis out of it, called the Birds Sanctuary. 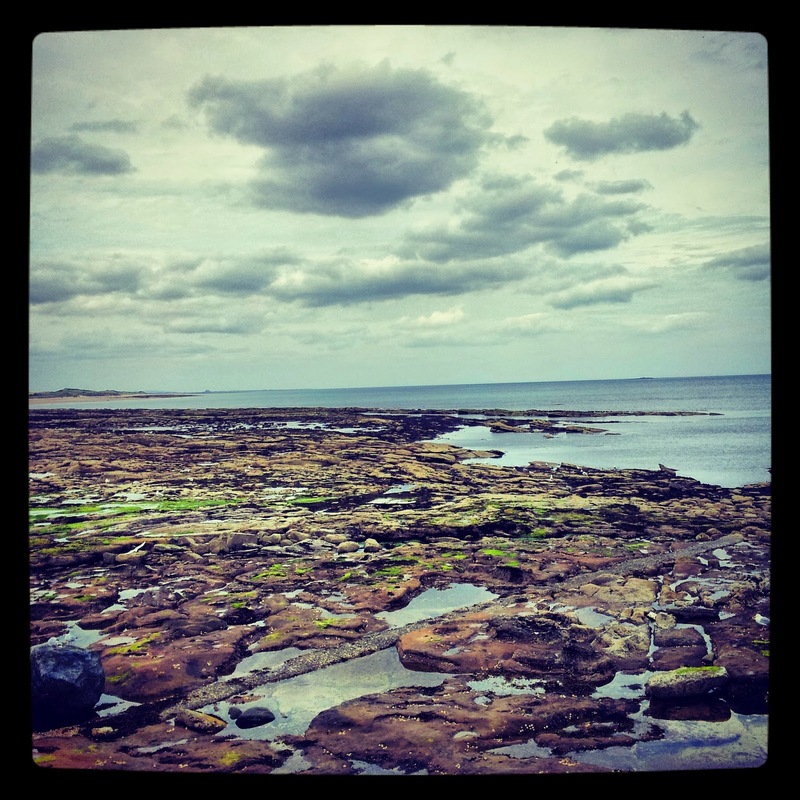 You can reach it with a boat tour: there are many of them and they all depart from the harbour of Seahouses. 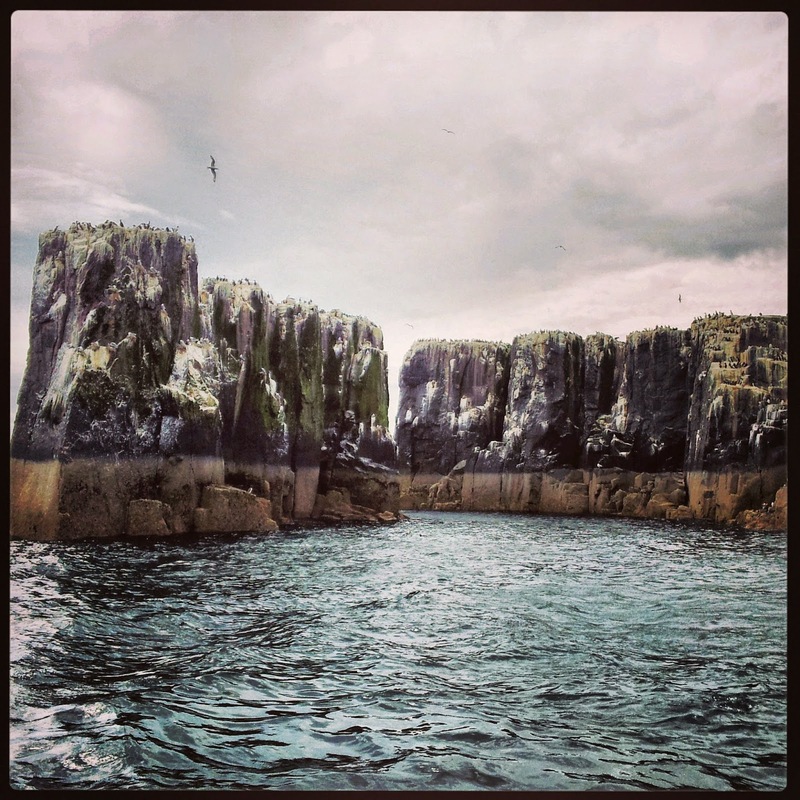 The approximated cost is about 30 £ (plus some other 4 £ for entering the island), and they consists of a circumnavigation of the archipelago with a landing of about one hour on the main island, the Inner Farne. Both on Lonely Planet and at the ticket office is warmly recommended to wear a hat or a hood when you land on the island. Sure, we think, no one enjoys a not-requested shampoo, expecially if it doesn't exactly smell of jojoba oil or silvestris pine. "Oh no, it's not for that" - giggles misteriously a guy we've met on the bus. "You are a couple of brave girls" - he adds, before getting off and leaving us. Ginger Cat and me stare at each other puzzled. The puffins! Those pretty birdies with a colourful striped beak and the eyes of a sad clown - aren't they cute? What should be menacing in such an experience? Maybe on the island there is also some pterodactyls? Maybe in the water lives the bully cousin of Nessie who makes the boats knock over? Or the tiny sad clowns are actually an incarnation of Evil, just like the one in S. King's "It"?? But, if we won't accept any balloons, I guess that even in such case nothing bad is going to happen to us. 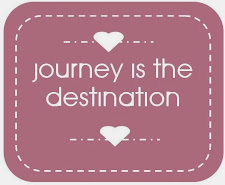 Well, anyway we are almost there, so let's go. And actually this sort of creepy mistery from one side is making me even more curious about the visit. We jump on the boat and little by little we get closer to the archipelago, coasting it. 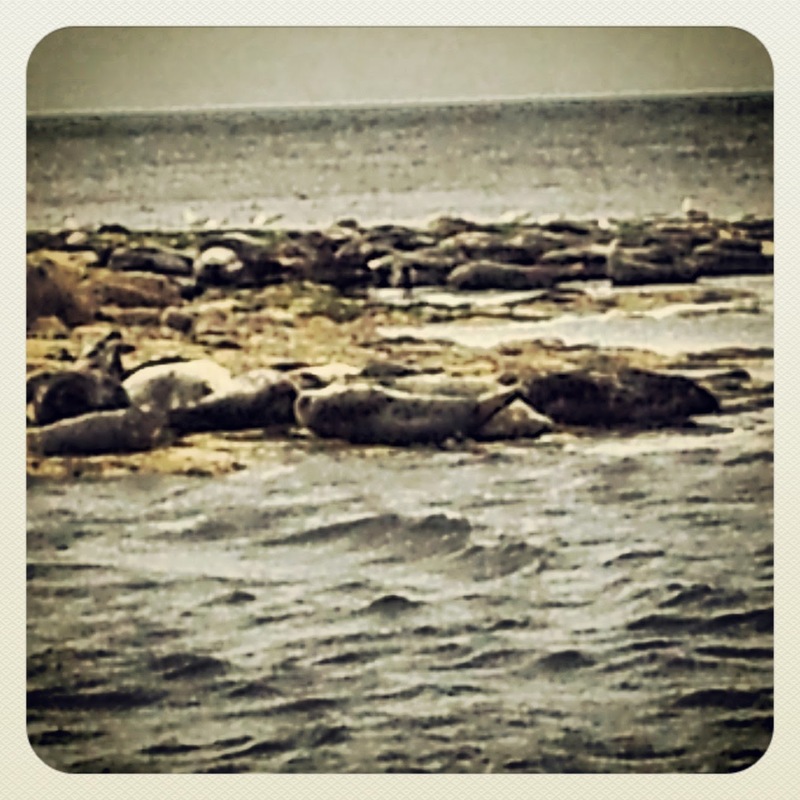 We see a pack of chubby grey seals sleeping on a minor island, almost camouflaging with the colour of the rocks. We pass in front of the Longstone lighthouse, and the boatman tells us the story of Grace Darling, the guardian's daughter, who, in 1838, became a sort of national heroine, because, in the middle of a storm, with a very thick fog and a ferocious sea, she's been able to save by herself, with her oar boat, nine survivors from the shipwreck. The boatman also tells us, in a not very reassuring way, that shipwrecks are quite common in this area, because of the very thick fog they often have and because the smallest islands disappear and reappear when you expect it least, depending on the tide level. I hope it won't have actually something to do with Nessie's cousin; but anyway, since 1800, there have been almost 250 shipwrecks. Are we at the Inner Farne yet??? I don't think it will take much longer, because the screaming of the birds is getting louder, and also my sense of smell is starting to perceive the approaching of the island. We sail close to its tall jagged coasts, which have three colours like a multi-layered sweet: where it's touched by the water, the grey of the rock is darker and more humid, while in the middle it keeps its natural colour. 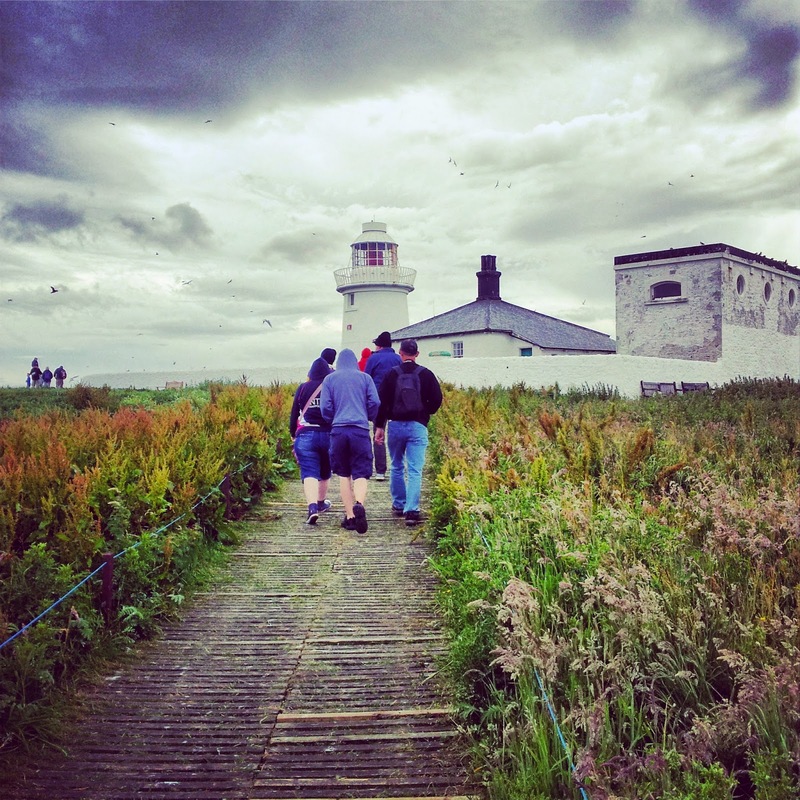 We take the delimited path that crosses the Birds Sanctuary: that's the only stripe of the island where humans are allowed - all the rest belongs to the birds. Near the path, on the ground inside the thick grass, there are some grey and black birds, a little bit bigger than a blackbird, but with a red beak, longer and thinner. They are the arctic terns. There are dozens of them, and they are hatching some light turquoise eggs with brown stains. Some already have their chickens, which hide, tiny and ruffled, underneath their wings. As soon as we take some pictures and we start thinking how pretty they are, I see one of them swooping on the head an unaware visitor. Maybe he must have done something to harass them, I think. Maybe he must have gone too close to the nest. But there it is another visitor being beaked by two terns. And he was just walking peacefully in the middle of the path. Their small black eyes are throwing thunderbolts, they scream, they open threateningly their beak, they whisk their wings and pounce on whoever passes by. "Don't you dare to touch my baby, filthy human!! Don't you dare even looking at it!" I guess they will grow up a bit over-protected, these baby arctic terns. But perhaps, if human presence gives them all this stress while nesting, why not preventing the access to the island in this period? And while I'm producing this solidarity though towards the hysterical birds, I feel my cranium getting drilled as well. What have I done to you?? I know that on Wikipedia there is written that cats are the main reason of death of arctic terns, but I swear my intentions were peaceful!! And yes, I looked at your baby, I even took a picture of it, but I promise you I have no intentions to sell its pictures to any tern-pornographic site! 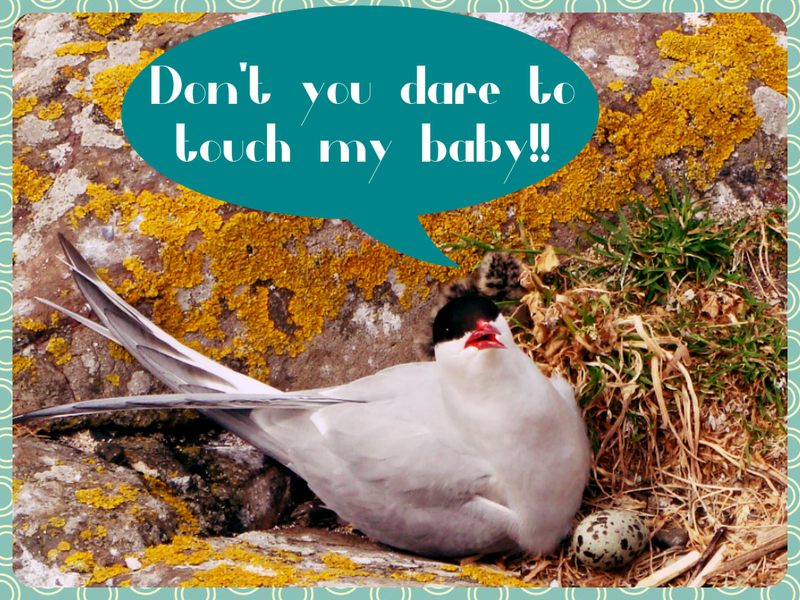 I just did it because it is a cute kid, the cutest tern chick I've ever seen! Ok, now I get why the hat. And moreover why we are brave girls. But I am NOT brave, I didn't know there were these hysterical birds! I had come to see the puffins, jeez! The National Trust rangers go by, completely covered by the same white and limy thing we saw on the rocks (the one which is not whipped cream), and with a mystical smile they tell us we just need to move our arms above the head to make them go away. But they look like Indian holy men, beyond the worries and the cares of this world. Or perhaps their scalp has undergone a genetical mutation and it's got covered by scales in order to become immune to the terns' pecks. Moving the arms doesn't seem to work too well. And moreover it makes me look hysterical. And *I* am not the hysterical one, for good sake!! It seems much more effective to hide into St. Cuthbert's Chapel. Here the beasts do not dare entering. St Cuthbert is now becoming the patron saint of this holiday: we had already met him at Holy Island. Fairly enough he must have wanted to build a franchising of churches along the Northumberland coast. Or perhaps he might have started from here and then, tired of getting beaked on the head, he preferred moving to Lindisfarne. The chapel is dark and suggestive, and has a beautiful window. But there isn't much to see. 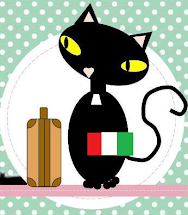 So I have to go out again. ...Do I really have to?? This chapel is so pretty! I think I've just got the spiritual urgency to stay in here a bit more. Ginger Cat convinces me to get out (dragging me by an arm, in a not very dignitous scene), and, luckily, beyond the wall of the chapel, in the other side of the island, there are no terns around. It's the realm of other birds, more peaceful and balanced. Cormorans, for example, that also have that kind of "do not touch my baby" stare, but they just get content of giving you a grumpy glance, without any pecks. Thankfully, otherwise I fear here the hat wouldn't be enough - at least an armour would be needed. Then different species of seagulls. And finally... here there are, the puffins! With their beaks full of fishes for their chicks. Now the boat will come to pick us up from this side, right?? You mean I'll need to cross again the Terns Realm? Ginger tries to reassure me: "Come one, they won't do you any harm" (no, they'll just beak me), "They are more scared of you than how you are of them" (right, but they have a stingy and red beak which I don't have). I guess she's right, but I prefer to leave behind any bit of dignity and reach the boat's pier running. Feeling a bit like Tippy Hedren, anyway. Who knows if maybe Hitchcock has ever come to visit this island? ?